Korean brands have taken over the makeup scene with their innovative BB and CC creams, as alternatives to traditional foundation creams and powders. 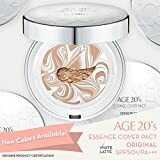 If you love Korean makeup, but need more coverage than their BB creams, then you can look for Korean foundation compacts and creams. Here are the best Korean brand foundation products available on Amazon. All the products featured here were made in Korea, and have great customer reviews. Our list includes best Korean foundation recommendations for all skin types, from dry and sensitive to oily and acne-prone, and all skin tones, from pale to dark. This innovative Korean foundation contains hydrolyzed collagen and hydrolyzed elastic, which have firming properties while giving skin a radiant glow. The product also contains goat milk extract for a lasting moisturizing effect. With a medium SPF30, you can rely on this foundation on sunny days. The C&T foundation is clinically proven to firm, fill, moisturize and generally improve skin appearance. The product is very easy to apply: just press the button and gently apply a small amount on your forehead, cheeks, chin and T-zone. Customers love this Korean foundation for its whitening and wrinkle-reducing properties. Moisturizes the skin so it does not dry out. Smooth skin cover, pores and wrinkles. Just like the product above, this light-beige foundation comes from one of the best Korean makeup brands: 22 chosungah. Featuring a high 50 SPF, the foundation is super safe for wear on sunny days, or even at the beach. With deep moisturizing properties, this foundation is recommended for dry and sensitive skin. If you are looking for a smooth covering of pores and wrinkles, this might be the best Korean foundation for you. The product is recommended by many beauty advisors for its perfect results. This is a 30ml liquid foundation from the famous range of cosmetics launched by Korean makeup artist “PONY.” If you want more coverage than BB or CC creams, but with the same kind of sun protection those Korean creams offer, then this is the foundation for you. It has a versatile 3-way action: it has the usual whitening effect, works against wrinkles and fine lines, and also has sunscreen included. The latter has an SPF of 30, which is more than acceptable for a foundation. With this foundation, you will not need an extra concealer to hide all those lines and wrinkles. 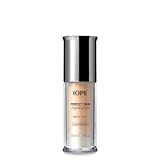 This best Korean foundation is very light, providing a natural finish. It is more suitable to dry and normal skin. YOUR NEW FAVORITE AIRY CUSHION !! A weightless cushion that gently wraps upon skin with an air-cover effect for a naturally good looking smooth, silkt finish. How to use : Using puff applicator, press down lightly onto pre-saturated suchion sponge to capture product. Enjoy free shipping on orders over $70.00. / This is Clubclio's direct management shop's Korean head office. / A signatory is required upon delivery of the item. This is a 100% authentic Korean makeup foundation from Beautynet Korea. 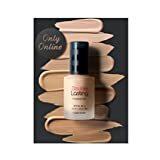 If you don’t like the excessive whitening effect that comes with regular BB and CC creams from Korea, this color matching foundation will suit your requirements. With an above standard SPF rating of 36, this 30ml liquid foundation offers something extra over its peers. It is available in a very cute animal-themed bottle. The creamy foundation has a good concealing effect on imperfections like freckles, blemishes, and even uneven textures. Two color options are available for this quality Korean foundation: beige and vanilla. If you have an uneven complexion, this is one of the best Korean brand foundation options you could use. Hera is another Korean brand which has come out with a smooth and creamy liquid foundation. This is a very versatile foundation, ideal for all skin types. Available in a stylish black 30ml bottle, the serum-based foundation has a very hydrating formula. It is only available in three natural shades, but you only need a small drop of this thick formula for even application on your entire face. 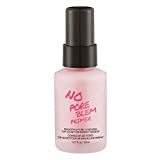 This serum foundation is best applied with your fingers, though you can also use a proper applicator brush. As this is a thick foundation, the bottle comes with a pump for easy access. It also has some level of sun protection, much like most other best Korean foundation products in our top. If you want complete and long-lasting coverage, with the added advantage of built-in sun protection, Clio is probably one of the best Korean brand foundation options out there. It has an advanced formula, with silicone pigments, for a long-lasting, flawless finish. As it has a semi-matte finish, this foundation is also great for women with oily skin. Along with full coverage, you also get an SPF of 35, which is nothing short of fantastic. With excellent coverage, this foundation can conceal even enlarged pores and other uneven imperfections on your skin. Despite all that performance, this is still a very light foundation. With the combined effects of a BB cream, concealer, highlighter, and an SPF rating of 37, this is a very versatile Korean foundation from the Too Cool for School range. This cream foundation will provide moisture to your skin, while hiding all the blemishes and other imperfections. It can provide a perfect glazed look to your face. The SPF 37 rating is perfect for those days when you have to be out in the sun a lot. It contains light-reflecting diamond powder to make your skin look extremely bright. If you have an uneven complexion, this is a fantastic option. 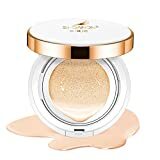 Etude House is one of the best Korean brand foundation options, and this is one of their best products that you can order on Amazon. Available in natural tones like beige, this is a creamy liquid foundation. With a thick and rich texture, you only need a drop or two to provide your face with long-lasting coverage. It is especially suitable for oily and combination skin types, as it has a matte finish. If you have blemishes, an uneven complexion, or even acne scarring, this foundation can help hide that. The foundation is suitable for all skin tones, from dark to pale, as it is available in five shades: fair, vanilla, beige, sand, and tan. On top of everything, you also get a sun protection factor of 34. 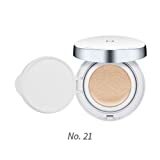 Contains flawless powder that never clumps even with additional application so that skin blemishes are covered without the cakey layer of makeup. Envelops the skin instantly upon application so that the perfect coverage effects lasts even longer. Contains super moisturizing hyaluronic acid that has a moist application that rehydrates and moisturizes the skin. After using Perfect Skin Base, pump a suitable amount onto the back of your hands, then use your fingers or a sponge to spread a thin layer across your entire face from inside to outside. 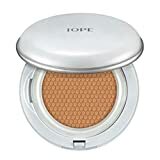 IOPE is another respected Korean cosmetics brand, and this is a lightweight powder foundation that they produce. If you prefer powder over cream-based foundations, this is probably the best option for you. It has a long-lasting formula that can help hide discolorations on your face for the entire day. For those dry skin types, this best Korean foundation powder also contains the goodness of hyaluronic acid. This active ingredient has a deep moisturizing effect on your skin. Though it has a lower-than-average SPF (25), this is still a great foundation, with superior moisturizing power. For All Skin - Our Concealing foundation use the unique purely natural dendrobe essence, it's suitable for all type of skin, including oily, dry, combination, acne, sensitive skin or even red skin. Long-Lasting - Does not like general BB cream foundation, this hydrating foundation is more than 12-hour lasting perfect make-up and good oil-water balancer, it's excellent at oil control and never be greasy. Moisturizing Cushion - The BB cream contain a moisturizing cushion for make up, which make the base makeup more easily and fast, and will create a light and breathable foundation. Concealer - The hydrating formula make the bb cream moisturizing and correct uneven tone of your skin. Its perfect concealing effect can cover fine lines and wrinkles on your face and make your skin status looks younger. Improved Formula - We improved formula V3.0 of our dendrobe BB cream cushion fondation which creates better control ability of oil and concealing effect but keeps in light weigh perfection for longer time wearing. This whitening foundation from Ohui is a fantastic option if you have a lighter skin tone, and want a foundation that can deliver extra light skin. Available in a compact form, this Korean cushion powder foundation has a superior coverage. If you have dark discolorations, acne scars, or blemishes, this CC-based foundation can hide them all. The long-wear formula holds everything together for almost the entire day. It is also very light and has an SPF of 50+. Ohui is a premium cosmetics brand from Korea, and they frequently release special editions of their cosmetic products. This CC cushion foundation is one such limited edition product. Enhance moisture retention in the skin quickly with water containing bio and moist skin and neatly. Myconos is a rather new, luxury beauty brand from Korea. They have some interesting products, one of which is this magic Cushion Compact. With a creamy liquid texture, this innovative, best Korean foundation has the impact of both a BB and CC cream on your skin. It has a whitening formula that adds luminous shine to your face. You will get medium coverage, with the ability to hide all but the most severe imperfections and discolorations. This versatile cream foundation also has moisture control, anti-wrinkle properties, and SPF for those days out in the sun. It is ideal for sensitive skin, and does not clog your pores at all. If you like quick and easy to apply makeup foundations, then you will love this cushion compact from the Korean brand Missha. It provides buildable coverage and high sun protection (SPF 50). With Micro Cover Pigments, this foundation provides perfect coverage against blemishes and dark spots. You will get a cleaner looking complexion with this Missha M foundation. With bamboo water and baobab extracts, this foundation provides a smooth and dewy finish. It contains witch hazel for a soothing effect on your skin. The baobab tree fruit and bamboo water extract provide moisture, making it perfect for dry and sensitive skin. This is simply the best Korean brand foundation you can find online. The best Korean brand foundation should do the work of at least three different products, including but not restricted to a foundation, concealer, highlighter, and SPF cream. The products on our shortlist have at least some of these effects on your skin. Do you like Korean cosmetics? What do you think about our list of best Korean brand foundation products? Let us know in the comments section. Love this assessment. With the focus on health, I wish you could include which ones are healthy. Thanks for your feedback. Which products would you add to the list?